The Bay of Fundy and a didgeridoo jam session. If that doesn’t get someone to click on this link I might as well just give up. I got an early start and did a bit more work by my wifi window before taking off. I had another big decision to make this morning. 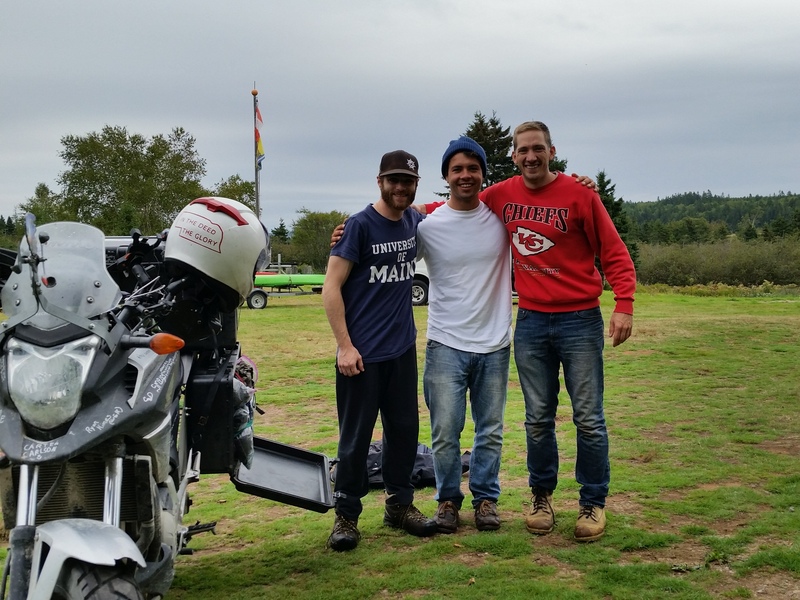 There is a legendary motorcycle ride called the Cabot Trail on the NE corner of Nova Scotia. If you ride a motorcycle to the province you have to ride it. After two delays in getting my new tire, I was becoming increasingly worried about the amount of tread I had remaining. Taking the ride would add a little over 500 miles to my route. Would a third delay be costly? I was not going to find out. As I’ve said often…Next trip. There were some other Hank Snow related stops I would have liked to make, but I was beginning to feel a bit pressed for time. I only made one stop on my was out: A place called Cosby’s, which was highly recommended by Vernon the previous day. 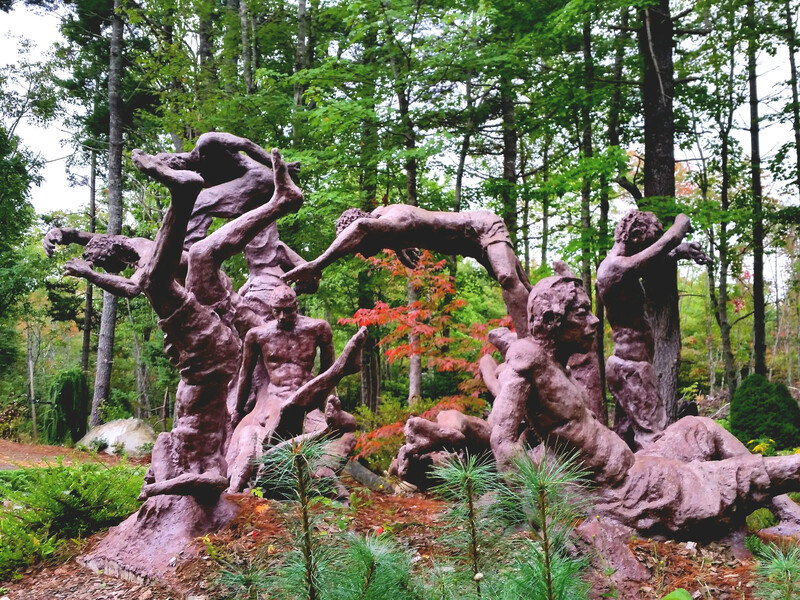 The same sculptor who made the Hank Snow statue has a garden center where you can walk right in and see his creations. 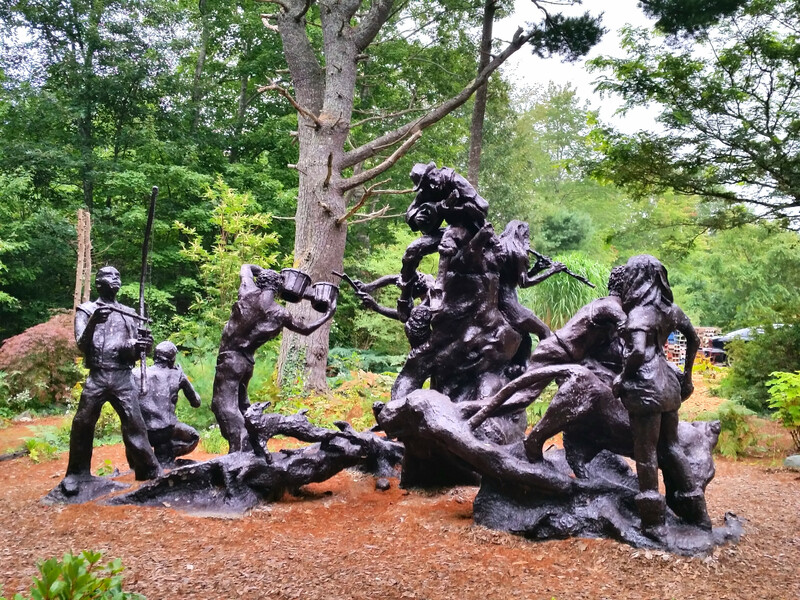 These sculptures are actually concrete, a unique medium. I thought it was very good art. The figures are artistically haphazard, but they are true to form and proportion. The day was mostly uninspiring, save for a free coffee at McDonald’s in Tantallon. I was wanting to make some progress, so I did not stop often. I was feeling “experience saturated.” So much had happened in the past week. I was still trying to process and document my Schefferville experience, then the Hank Snow museum happened….All great things, but I was feeling like I could not write as quickly as I could experience. Accordingly, I resolved myself to having a quiet night filled with mundane actions and an ample number of words typed. Boy…did I pick the wrong campsite. 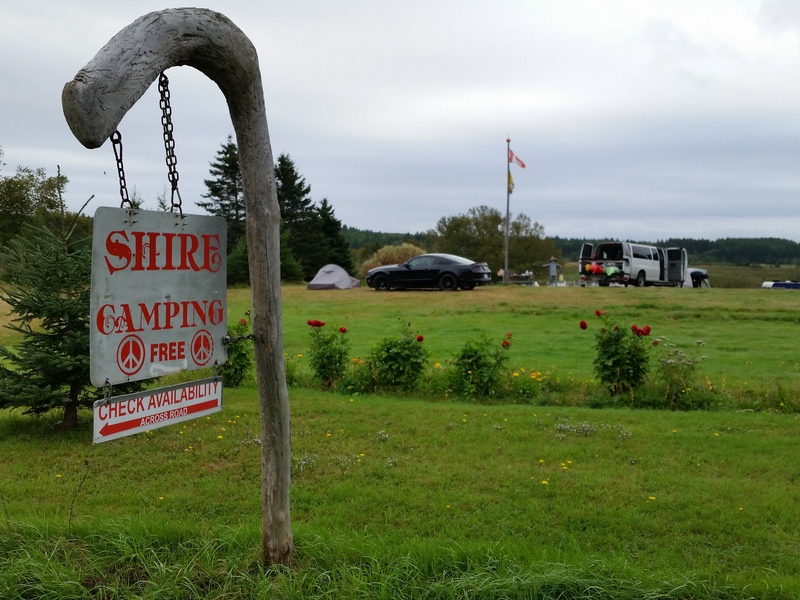 I’ve referenced the website freecampsites.org earlier in this account, but that website is where I learned about “The Shire.” A free campsite with tons of good reviews. I’m in! Traffic was really slow through Moncton, but I eventually turned and headed south along the Bay of Fundy. The sign for The Shire said to inquire about availability across the street at a residence. As I pulled up, it almost looked like I was expected. 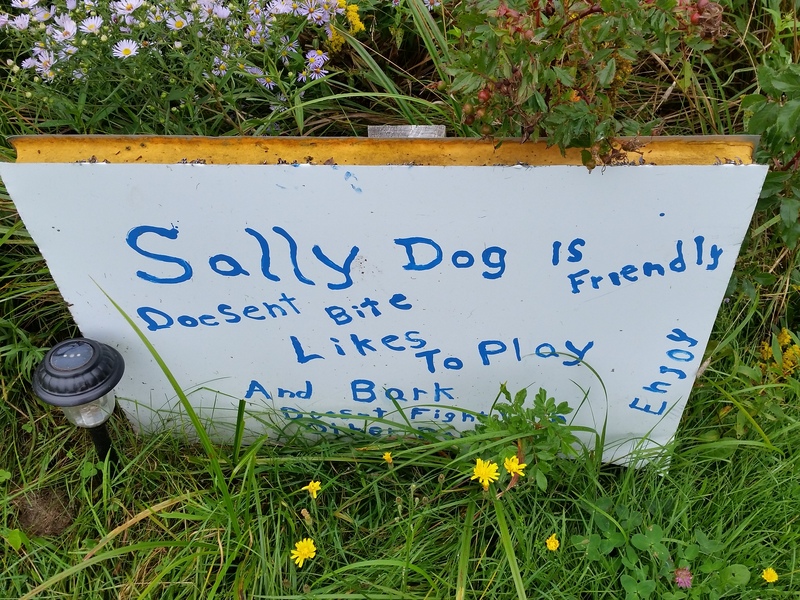 First to greet me was a big yellow lab named Sally. She barked, more out of compunction than conviction, still uttering some muffled “wuffs” as she lowered her head for some petting. Don was also sitting outside, beneath a lean to connected to the house. I heard him say something about how Sally doesn’t bite as I pulled out my first ear plug. He also introduced my to a version of the song by a Canadian artist called Stompin’ Tom (a member of the nicknames hall of fame, no doubt). It is a strange mix of similar and different. He was actually born just up the road in New Brunswick. Don was really interested in my story and we had a good time chatting. The story of my Hank Snow museum performance somehow came up and he seemed excited that I could play. He asked me to come over and play a bit after I got all set up. As we talked, Nick, who lives in the house in the summer, drove up. He was a musician too. Uh oh. This isn’t going to be an uneventful evening. I hit it off right away with those guys too. They were both men with adventurous spirits, so we had lots to talk about. Their current venture was a kayaking trip up the coast. We talked for a little bit and I told them what was going to happen over at the house. Nick was already strumming away when I walked over to the little lean to garage beside the house. I told him that as far as guitars go, I MUCH prefer a classic stringed. (How those steel string abominations became the standard I will never know) Like magic, Don went in the house and brought me one. I began with “I’ve Been Everywhere”, not nearly as good as at the museum. Nick responded with another Hank Snow song, “Miller’s Cave.” I played the other Snow song I know “I’m Movin’ On.” Nick has an awesome voice and could follow my playing well. He played some complicated songs, but I tried to accompany as best as I could. Don was on the phone a few times, inviting over friends and neighbors to his little lean to. More people came and more instruments came out of the house. A lady named Betty played a song about the Bay of Fundy that her father had written. Eventually, there were about 10 of us sitting around. Someone would lead a song and others would join in, then we’d stop and chat a bit, laugh, pet Sally, etc..; before the next song would begin. It was so natural, so efortless and everyone seemed to be enjoying themselves. I never even got out my phone to take a picture, wanting to be immersed in these special moments. Somewhere in the line of conversation, it came up that Max could play the didgeridoo. Almost nonchalantly Don said, “Oh yeah, I’ve got a couple of those.” Into the house went Don and out came a couple of didgeridoos. It was fun hearing Max talk about the technique involved with playing one. Learning to circular breathe is a requirement, an impressive skill. Being a former all-state tuba player, I figured I would at least give it a shot. OK. I have to get my camera. Otherwise no one will believe this story. What a fun night! I think it was 10pm before I finally got to eat some noodles, but it was well worth it. Jeff and Max shared some French press coffee as well as some oatmeal. We got to talking again and continued for some time. The previous night, Max had been adamant that I should be marketing my journey more intentionally. He used the word “inspiring” to describe it. Maybe I’ve heard that word before, but the way he said it really made me believe it. Our discussions were great. We limited the conversation to simple topics like God and quantum computing. They were both really sharp guys. We finally exchanged info and parted ways. Jeff invited me to come on a kayaking trip once I get to Florida (that is his job). He said that work would be slow with the hurricane(s), so he would have time to take me out. I’m looking forward to it! Has there ever been a picture of three guys more likely to utilize a free campsite? Before riding away, I went to thank Don, my gracious host. His campground really is free (though, be warned, you will feel compelled to leave a donation). The only thing he requires is that you must sign his guestbook: Draw a picture, tell a joke, write down your website. 🙂 He wants to remember his guests. I think he really enjoys hearing all of the stories. Max, Jeff and I actually had the same destination next: The Hopewell Rocks. This is an area that has one of the biggest changes of tides in the world (up to 50 feet!). 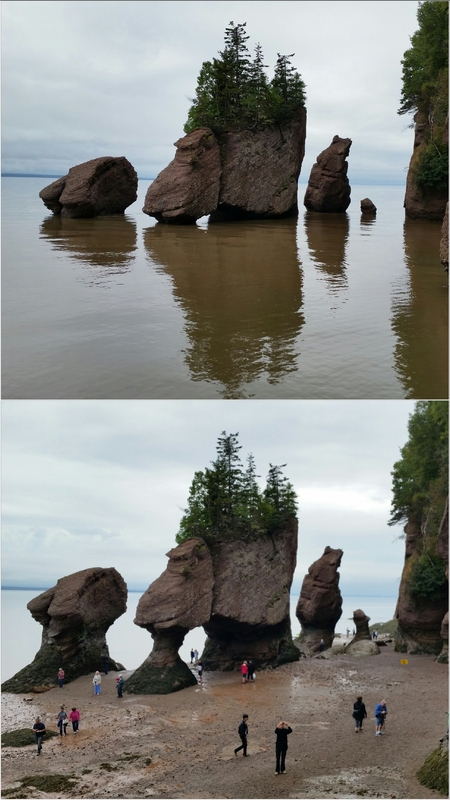 At Hopewell Rocks, you can actually walk on the ocean floor. 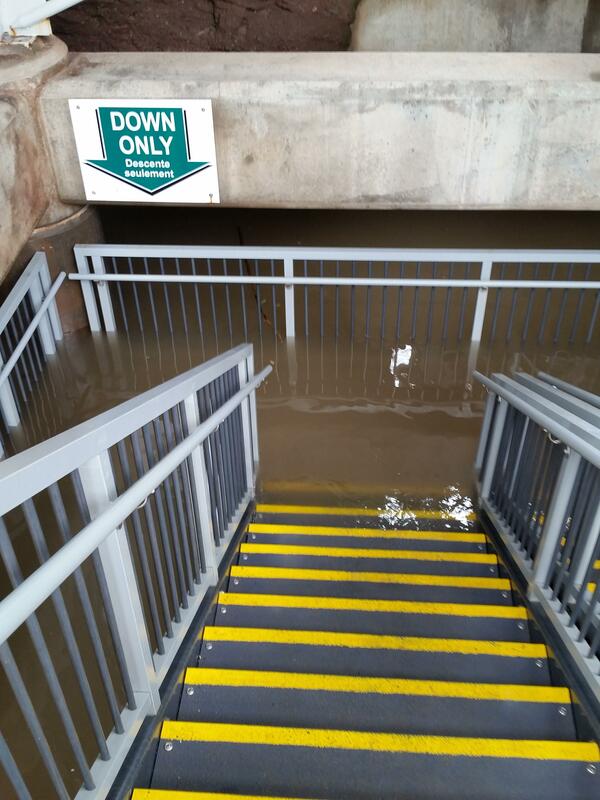 I arrived around noon, right at high tide. I sat and worked while I waited for the moon to lose its grip a bit. The beach was open around 3:30. I tried to get a picture at the exact same spot. How did I do? Time to head out. To where? To home, in a sense. I set a goal of crossing back into the US by days end. The ride on country roads was nice. Less so once I got on the freeway, but I was starting to get a bit concerned about my remaining daylight. The rest of New Brunswick passed without incident. I crossed the border at…..I have no idea what time it was. I’ve been in way too many time zones. I just knew that I was probably not going to get set up in the daylight. The border guard was really nice and did not take the lone apple that I was carrying. I headed for a spot called Reversing Falls park. 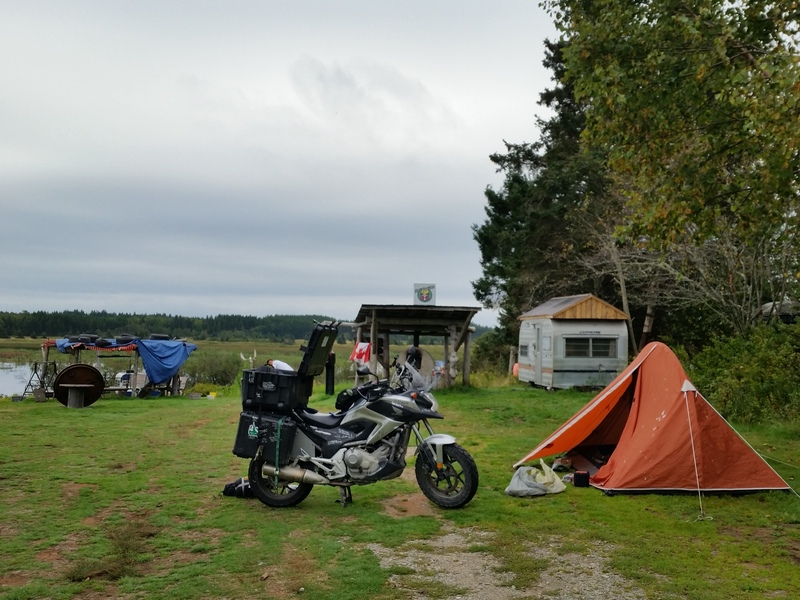 The free camping website said that camping was “neither encouraged nor discouraged.” Might as well put out a welcome mat for me! I got set up on some inclined lumpy ground. Less than perfect, but it was nice to be “home.” I can’t begin to explain what a benefit it is to have access to mobile internet when on a trip like this. Being able to pull up weather radar and forecasts, accurate satellite maps, videos of cats being weird….it really is a great benefit! Realtime update: In a library in Watertown, NY. I have decided to head across New York state, solely to check off Buffalo. It is out of the way, but will allow the rest of this loop to take an efficient path. I’m still struggling a bit with my mentality and enthusiasm. I’ve been on the road for nearly four months and I can feel it wearing on me. I think being behind in my recording of this trip might be part of it, so I’m planning a few low mileage days to hopefully catch up. Thanks again for all of the prayers and support! Hi Brett, we met at Schoodic during the high waves. We are loving your posts. A lot of us dreamed of doing what you are doing. Thank you, Melissa. I love how you signed Annie, “Life is the gift.” I’ve read that often. Congrats on being the first NC’ers on the bike. Thanks for coming along! Hi Brett, I’m still very much enjoying your posts! As Seth also mentioned and of course based on the many comments you get here, you can always turn to your readers for some company when you’re feeling alone! In my first comment I mentioned I was practicing on getting my motorcycle license. I can now say that a lot of the exercises are on exam-level, so that’s a good thing. Now that I know how it feels to ride a motorcycle I find your journey even more impressive. It’s not as easy as it looks! Take care and safe travels, you are doing great! ‘High’ speed (31 mph) exercises: https://www.youtube.com/watch?v=tQ_W_6AUWxg&feature=youtu.be&t=412 (Low speed exercises start at the beginning of the video). K Brett, the Mainers…Maineoites….Mainiacs… seriously 😂 loved it!!! And the pics of high tide, low tide just amazing 😉! Just was thinking we are never alone but always alone. Our minds sometimes get to us because our perspective changes, but just know this trip, this path is the right one, and thanks for including all of us!!! But which one IS it!? 🙂 Thank you for the encouragement. It means a lot. 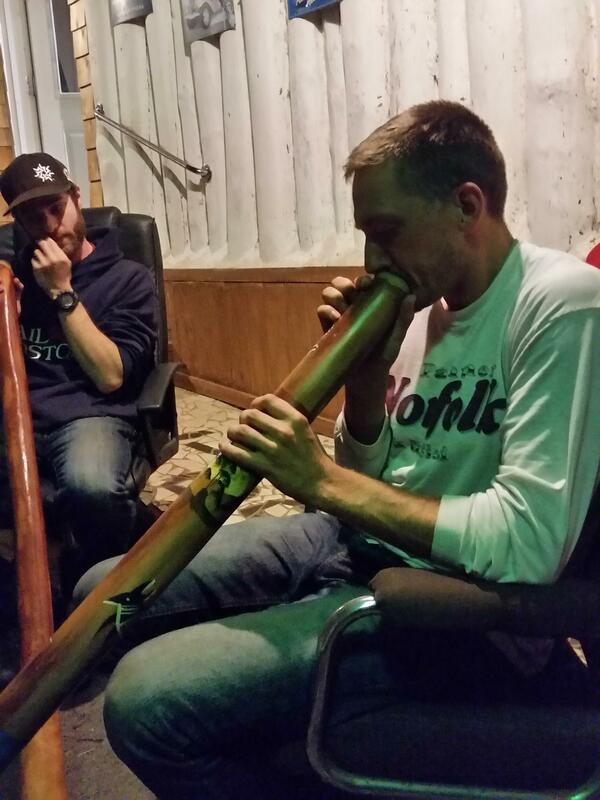 Only you could find folks who play a didgeridoo! The tide photos are amazing! Keep up the posts, love reading them! Great to hear from you! Can’t wait until my road passes through Marne again. It’s wonderful to watch your adventures unfold. I’m fortunate to have shared a small portion of your trip, if only it could have been longer. BTW, I don’t think our conversation ever drifted to music, but I’m also a musician and formerly an All-State Tina player. Ride safe pard. No way! I knew there was a reason we got along so well. 🙂 But if you don’t mind me saying: Aren’t there only 2 or 3 tuba players in the whole state of WY? Ha! Sorry about that. I’ll make sure to let you know before I pass through Colorado. You are always welcome to join me! See all those comments? You’re going viral after all! Uh oh. Medicine is expensive. No medicine like the laughter and enjoyment you are giving us! 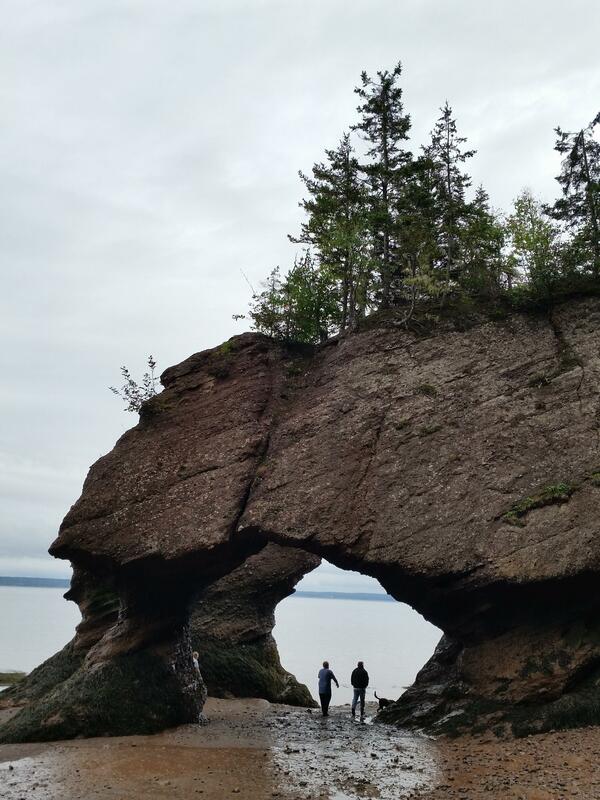 Great pictures of the Bay of Fundy. Loved the music jam session video and the Canadian version of Everywhere. Yeah, I can’t wait to see what comes next. Thanks for the prayers!